The practice of poaching is abhorrently prevalent across the world and across animal species and has been successful in endangering, if not obliterating entire species. South Africa’s national reserves have become home to poachers on the hunt for popular and pricey illegal exports: namely rhino horns, elephant tusks, big cat body parts and bones as well as pangolin scales. Although South Africa’s poaching is largely associated with the rapidly diminishing rhino population as well as elephants, it is actually the pangolin that is the most poached animal not just locally but in the world. Pangolins are small, scaly nocturnal mammals that subsist on a diet of ants and termites. There are eight different varieties of pangolins that can be found across sub-Saharan Africa and parts of Asia. So what makes these small creatures so special? The answer lies in their scales. The scales themselves consist of concentrated keratin – the same substance that can be found in our hair and fingernails, as well as rhino horns and animal hooves. The pangolins’ scales are used in traditional medicines, high-end cuisine and even fashion. Scientists have estimated that “more than one million pangolins have been poached in the past decade” (National Geographic, 2017). Due to the number of pangolins being poached year on year, it is almost impossible to quantify the number of pangolins still in existence. South East Asia, China, and now South Africa have been particularly affected by this poaching and trafficking trend. The shift from Asia to Africa can largely be attributed to the fact that Asia’s population has been all but decimated. 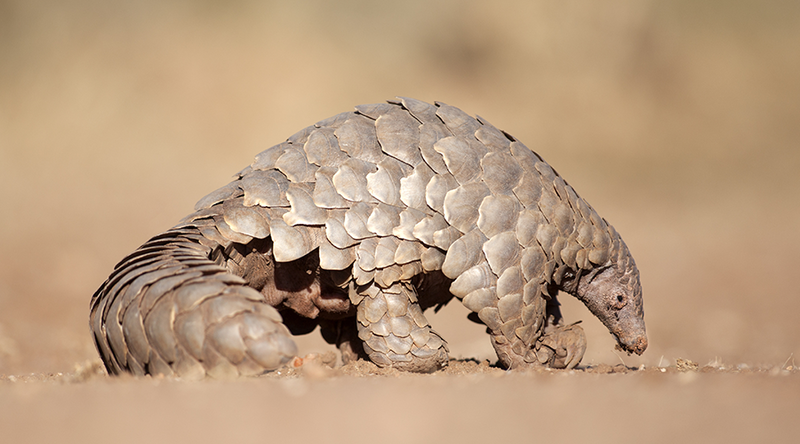 Much like the demand for rhino horns and elephant tusks, the rise in the demand for pangolin scales can be ascribed to the fact that “anything that is really rare and exotic is desirable. It’s a symbol of wealth, anything seen to be delicacy is now in vogue” (Crawford Allan, senior director of the wildlife trade monitoring network TRAFFIC at World Wildlife Fund). An even more problematic finding in the research done on the pangolin poaching and trafficking trend is that “almost half of the pangolins killed were juveniles” (the Journal Conservation Letters, 2017), which means that most of the pangolins killed are done so before they are able to reproduce therefore endangering the already highly exploited species further. This is also a particularly heart-breaking statistic as pangolins are slow to procreate and only produce a pup or two a year. Africa contains four out of the world’s eight varieties of pangolin, namely the giant, black bellied, white bellied and the cape pangolin. However local estimates of pangolins killed are unlikely to fully represent accurate figures due to the fact that the cape pangolin exists outside the study area, as well as the fact that it is illegal to kill giant pangolins in all countries, which means that all giant pangolins trafficked and traded are done so illicitly and are therefore not all accounted for. Not all hope is lost, with new preventative anti-poaching methods being implemented all the time, however until there is a lull in market demand, the poaching is likely to continue for now.